Upgrade to a YukChuk. KITCHEN FOOD WASTE COLLECTION HAS NEVER BEEN SO EASY. *Don't build them like they used to? -- "WE JUST DID". Not just another me-too Plastic Bucket! Specifically engineered and designed for homemaker-easy kitchen food waste collection. High Density Polypropylene. *Using a Food Waste collection Container in your kitchen has never been this easy. YukChuk raises the bar for Kitchen Food Waste Collection in our Collection Pail with Patent Pending design. * Our 'LIVING HINGE' proprietary technology is engineered into the mold design and exacting production process controls. Not just a thin plastic strip. *Twin Lid Locks to seal. -- NO Fruit Flies, NO Odors. -- Simple one-handed operation, for quick and homemaker friendly use. - The only Living Hinge food waste container available -- THE most Sanitary! -- Dishwasher Safe on HOT cycles. -- Mounts behind kitchen cabinet door or free standing. -- Mounting bracket included at no extra cost. -- Small profile, large 1 ½ gallon capacity. -- No $$ Charcoal Filter to replace, NO need, NO ongoing replacement costAt YukChuk LLC we have never, and never will, come to market with a 'me too' product. Designing outside the box is our way of life. In fact we don't know what a box is! Upgrade to a YukChuk under counter food scraps bin and 'presto 'NO odors, No fruit flies. No charcoal filter replacement costs, NO need. Made from high-density polypropylene, (HDPP), the same material used in milk containers and other food containers. HDPP is known for its non-leaching characteristics. Mounts behind kitchen sink cabinet door for easy access, easy (one handed) use. Bracket and screws included. HOT wash and HOT cycle Dishwasher safe, not like the other guys who's material will withstand Cold in dishwasher. Great fit for YukChuk BIO-BAG Liners. 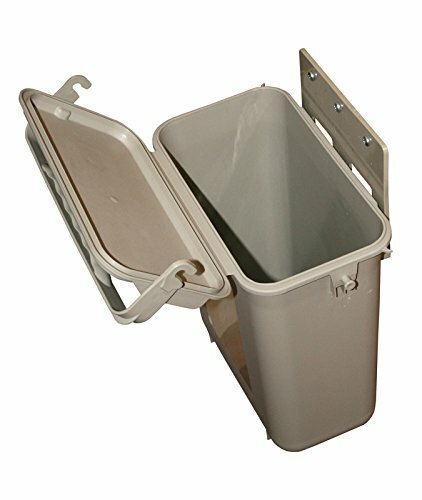 View More In In-Home Composting Bins. If you have any questions about this product by YukChuk, contact us by completing and submitting the form below. If you are looking for a specif part number, please include it with your message.